Till a few years back there was a great deal of dietary fat-phobia among the general population and athletes alike, and most forms of dietary fat was avoided as it was feared that it would cause body fat gain and heart attacks. While it is true that anything consumed in excess is unhealthy, it is also true that dietary fat consumed in moderate amounts is actually great for your overall health. And one particular source of dietary fat is gaining a very positive reputation these days, yes, I am referring to coconuts. Nowadays you will find a lot of positive talk about the benefits of coconut oil, coconut milk for those who are looking to lose weight, and especially those with thyroid disorders. 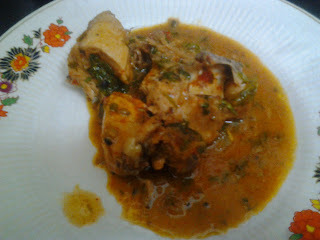 So here is a recipe that I recently tried involving coconut milk and chicken, which turned out to be great, and as you must have guessed it by now, healthy too. It's simple to make and tastes great, and definitely worth a try. · Beat peppercorns, coriander roots and ginger together. · Heat peppercorn mixture in a wok. · Stir in chillies, coconut milk. · Heat to simmering point. · Mix the chicken pieces. · Cook over medium heat till the chicken is tender and liquid is reduced, it will take about 40 to 45 minutes. · Garnished with coriander leaves. · Serve hot and enjoy.